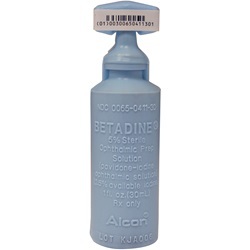 Betadine 5% sterile ophthalmic prep solution comes in a 30mL form sealed blue HDPE bottle. Generic drug name is Povidone-Iodine. Manufactured by Alcon. NDC Number: 00065041130. Comes as singles.